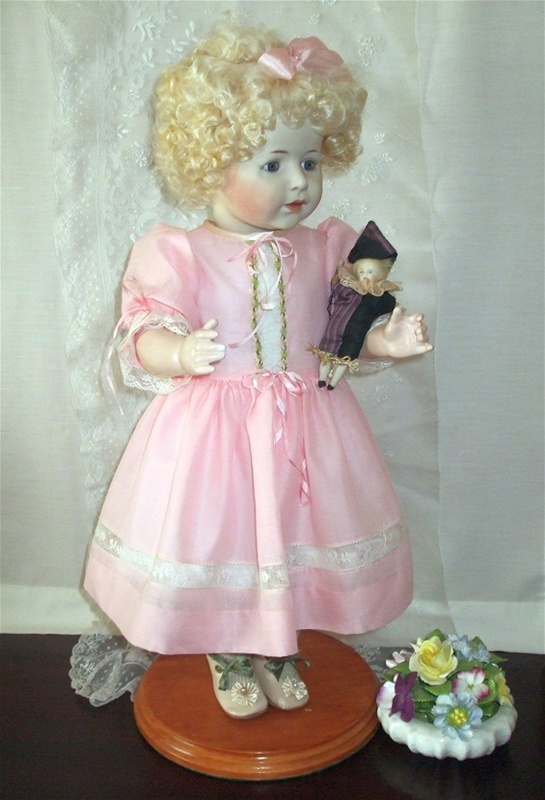 The dolls shown below are for sale now. 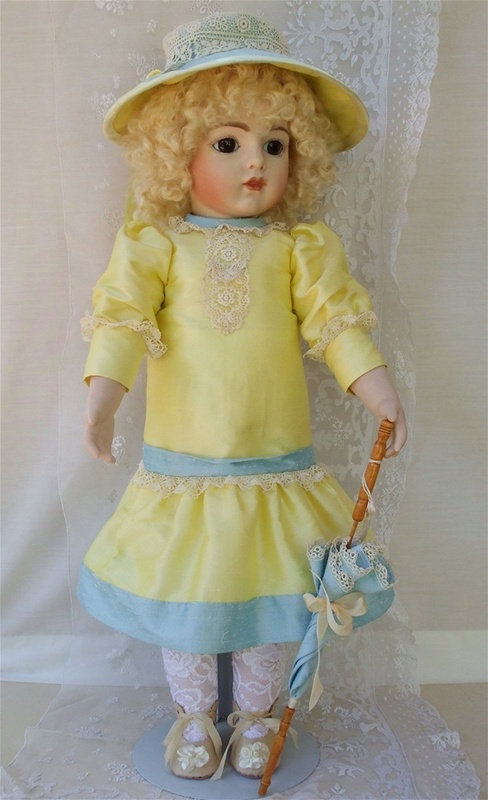 These dolls have all been made, painted and dressed by Judith Butcher of Chessington Products, who is a member of the Doll Artisan Guild. 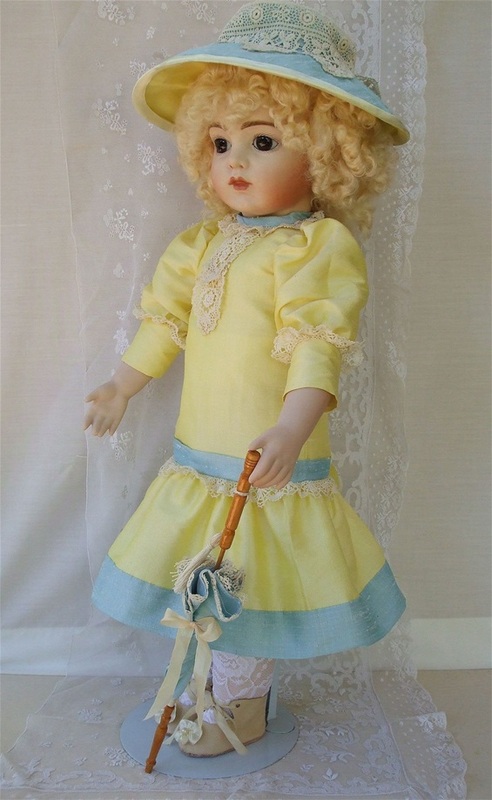 Antique Reproduction Doll "BRU" 23" dressed in yellow and blue silk trimmed with cotton lace. 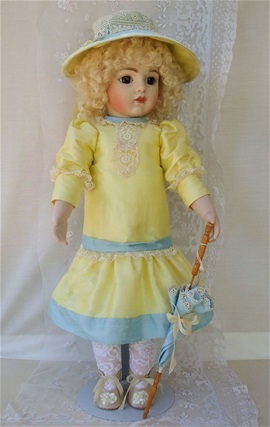 Another view of Antique Reproduction Doll "BRU" 23" dressed in yellow and blue silk trimmed with cotton lace. Dressed in pale pink silk outfit - Jacket trimmed with silk flowers. 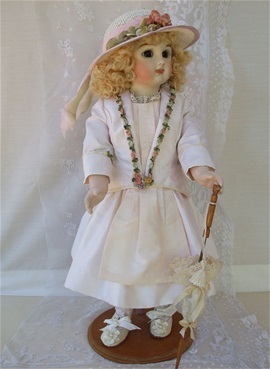 Another view of Antique Reproduction Doll "Tete Jameau" 18" dressed in pale pink silk outfit - Jacket trimmed with silk flowers. 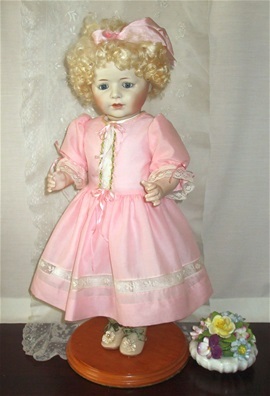 Antique Reproduction Doll "Tete Jameau" 18" dressed in pale pink silk outfit - Jacket trimmed with silk flowers. 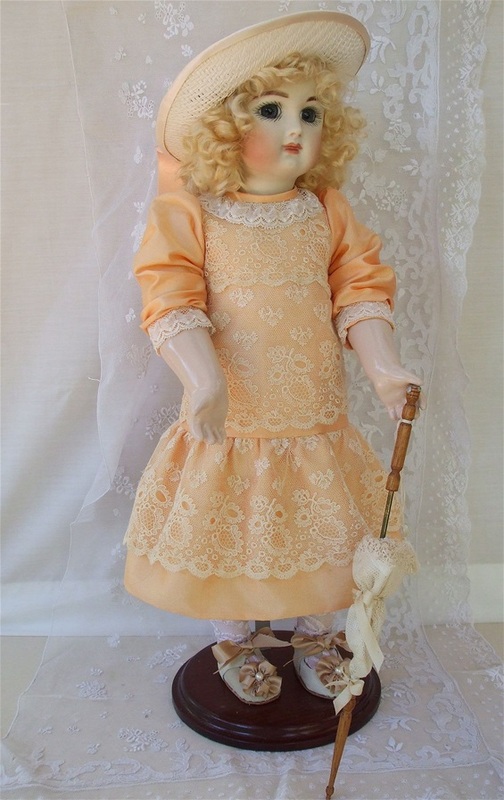 Dressed in apricot silk covered with old lace. 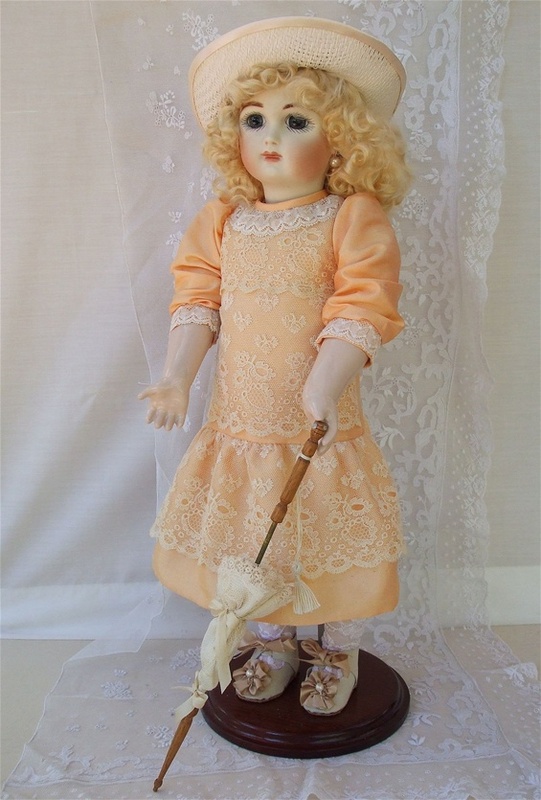 Antique Reproduction Doll "Tete Jameau" 18"dressed in apricot silk covered with old lace. Another view of Antique Reproduction Doll "Tete Jameau" 18" dressed in apricot silk covered with old lace. 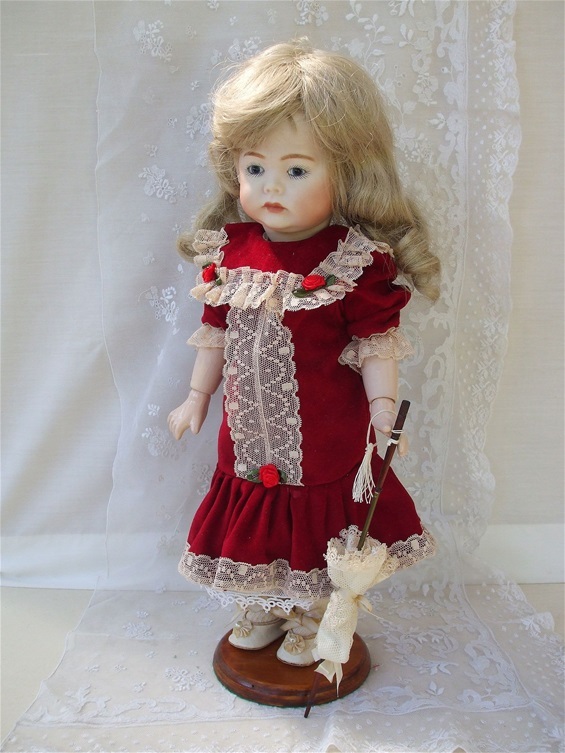 Dressed in red velvet trimmed with acru lace. 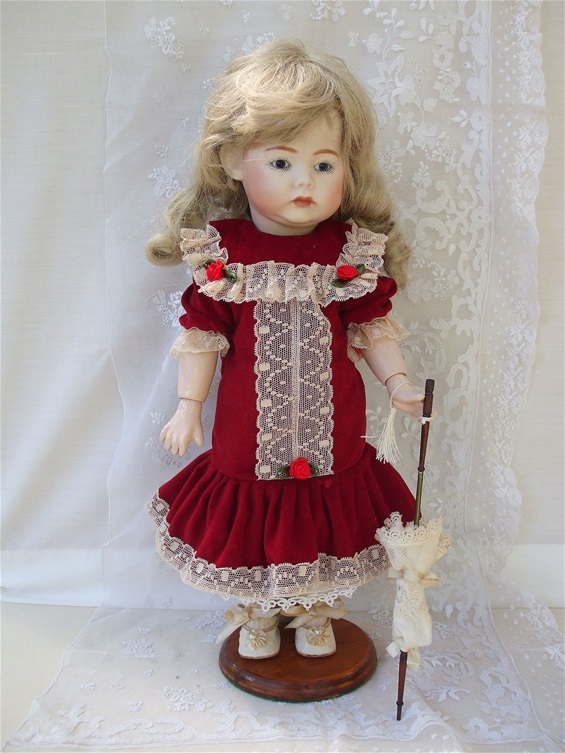 Antique reproduction doll "Fany" AM 231 16" dressed in red velvet trimmed with acru lace. Another view of "Fany" AM 321 16" dressed in red velvet trimmed with acru lace. 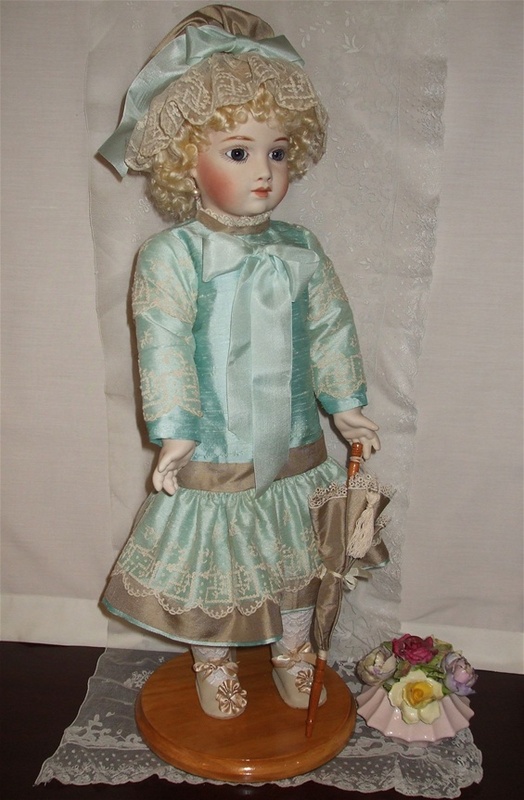 A Thullier AT 11 - "Alicia"
Dressed in aqua and cocoa silk with antique cotton lace and silk ribbons. Antique reproduction doll A Thullier AT 11 - "Alicia" 23" dressed in aqua and cocoa silk with antique cotton lace and silk ribbons. 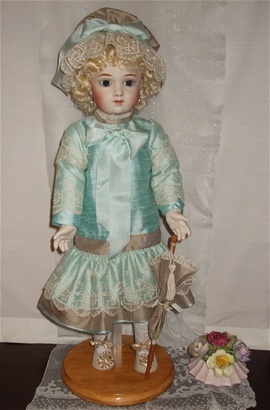 Another view of antique reproduction doll A Thullier AT 11 - "Alicia" 23" dressed in aqua and cocoa silk with antique cotton lace and silk ribbons. 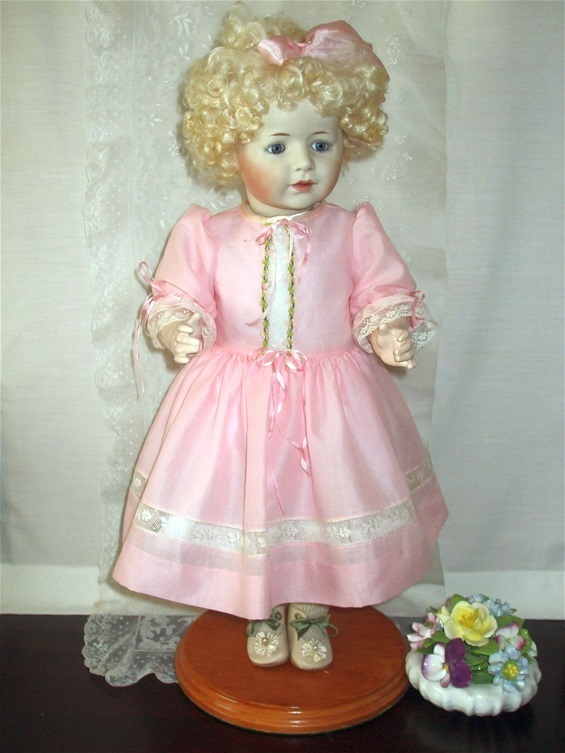 Antique reproduction doll "Sallie" Simon and Halbig 1488 dressed in pink cotton material and cotton lace with silk bow in hair. 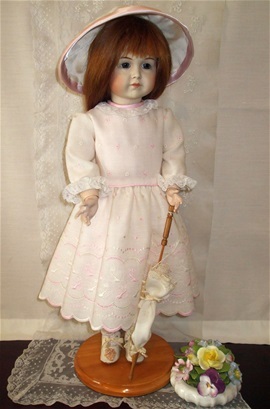 Another view of antique reproduction doll "Sallie" Simon and Halbig 1488 dressed in pink cotton material and cotton lace with silk bow in hair holding small doll in left arm. Another view of antique reproduction doll "Sallie" Simon and Halbig 1488 dressed in pink cotton material and cotton lace with silk bow in hair. 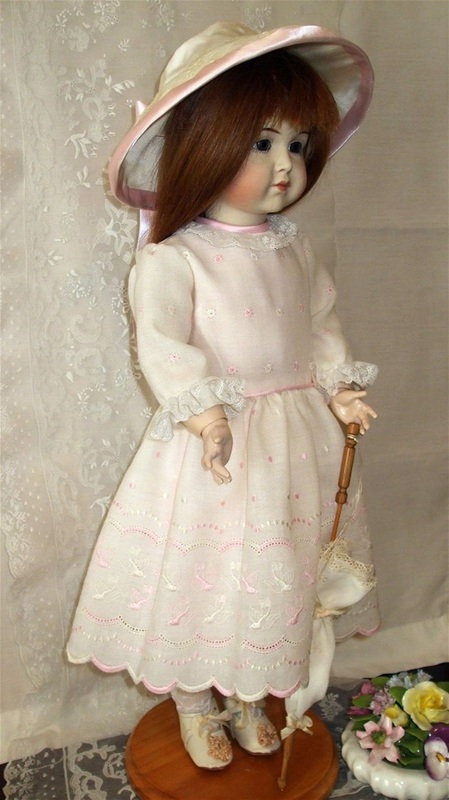 Mein Leibling K*R 117 "Inga"
Dressed in embroidered wool and lace. 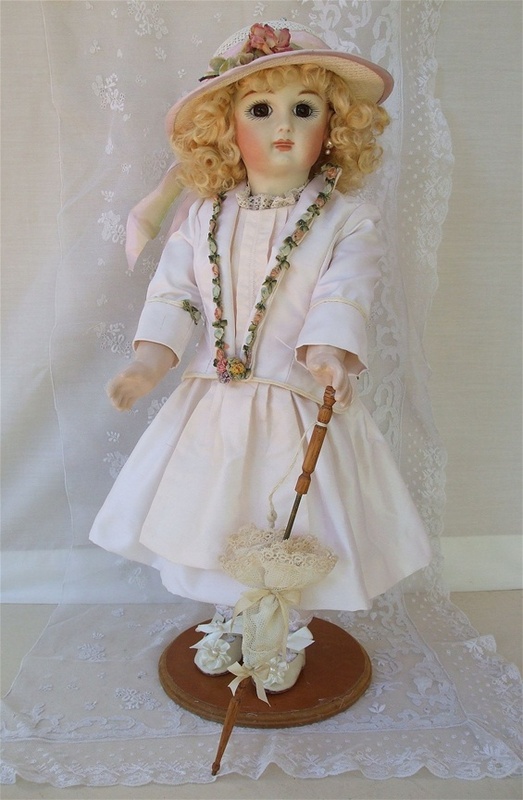 Antique reproduction doll Mein Leibling K*R - 117 "Inga" 22 inches dressed in embroidered wool and lace. Another view of antique reproduction doll Mein Leibling K*R - 117 "Inga" 22 inches dressed in embroidered wool and lace.